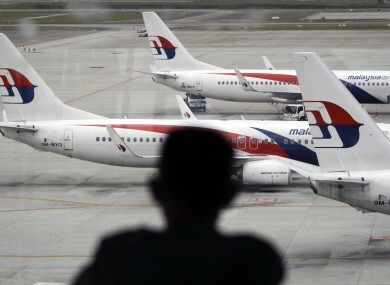 A man views a fleet of Malaysia Airline planes on the tarmac of the Kuala Lumpur International Airport. MALAYSIA HAS SAID the search area for the missing Flight 370 will be expanded by another 60,000 square kilometers in the Indian Ocean if the jetliner is not found by May. Transport Minister Liow Tiong Lai told reporters that Malaysia, Australia and China, which are leading the search for the Boeing 777 that went missing on March 8 last year, are “committed to the search”. If the aircraft is not found within the 60,000 square kilometers, we have collectively decided to extend the search to another 60,000 square kilometers within the highest probability area. The two areas together would cover 95% of the flight path of the plane, which went missing while on a flight from Kuala Lumpur to Beijing with 239 people on board, the minister added. It dropped off radar, and investigators later discovered that it made a series of turns and headed in a completely opposite direction from where it was heading before crashing into the Indian Ocean. “We are confident we are searching in the right area,” Australian Transport Minister Warren Truss said at the news conference, alongside Liow. We are confident we have the best search equipment .. if the plane is in the area we will find it. He said Malaysia and Australia will continue to fund the cost of the next phase of the search. He or the other ministers did now say how much it would cost. Email “No one is giving up in the search for MH370”. Feedback on “No one is giving up in the search for MH370”.